O God, who in this wonderful Sacrament have left us a memorial of your Passion, grant us, we pray, so to revere the sacred mysteries of your Body and Blood that we may always experience in ourselves the fruits of your redemption. Who live and reign with God the Father in the unity of the Holy Spirit, on God, for ever and ever. The Sacrament of the Eucharist | Rev. G. D. Smith D.D., Ph.D. While they were eating, he took bread, said the blessing, broke it, gave it to them, and said, "Take it; this is my body." Then he took a cup, gave thanks, and gave it to them, and they all drank from it. He said to them, "This is my blood of the covenant, which will be shed for many." Where the Solemnity of the Body and Blood of Christ is not observed as a holy day, it is assigned to the Sunday after Trinity Sunday, which is then considered its proper day in the calendar. Please see this special section on Corpus Christi. The feast of St. Charles Lwanga & Companions, which is ordinarily celebrated today, is superseded by the Sunday liturgy. Symbols: The usual symbol for the Holy Eucharist is a chalice, with a host rising out of it. The chalice is shown with a hexagonal base, as a rule, symbolizing the Six Attributes of the Deity (power, wisdom, majesty, mercy, justice and love), and with a richly wrought stem of gold, studded with precious stones. 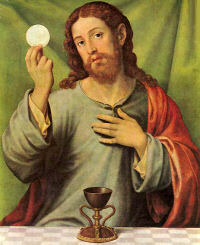 The host is shown as the typical circular wafer, upon which may be imprinted the letters I. N. R. I., from which proceed rays of light, symbolical of the Real Presence, the substantial presence of Christ under the species of bread and wine. An altar, upon which is set a cross, two or more candles in their tall candlesticks, a chalice and a ciborium, is another symbol often seen. The Directory on Popular Piety explains Eucharistic devotion and Eucharistic adoration. Encourage your pastor to have a Eucharist Procession on the Feast of Corpus Christi. Freshly baked bread would be a key dish at your celebratory Sunday dinner, as bread has always been symbolic for life giving and nourishment, as is the Eucharist. We have also highlighted a Christmas cookie recipe called Lebkuchen (life cake), which is rich in symbolism. The fourteenth encyclical letter of Pope John Paul II Ecclesia de Eucharistia (On the Eucharist in Its Relationship to the Church) released on Holy Thursday, April 17, 2003. The focus of the papal encyclical is the celebration of the Eucharist; the Pope reminds us that the Eucharist is the center of Catholic spiritual life. Redemptionis Sacramentum (On certain matters to be observed or to be avoided regarding the Most Holy Eucharist), an Instruction released by the Congregation for Divine Worship and the Discipline of the Sacraments on March 25, 2004. "Bring in here the poor, and the crippled" (Gospel). Last Thursday was the Feast of Corpus Christi. This Mass sets forth the social graces flowing from the "Body of Christ" into the "large place" (Introit) of everyday life; how Divine Providence will "never fail to govern' (Prayer) and direct the social order. We can learn to "love the brethren" when "we have come to know His love" (Epistle), in His Sacrament and Sacrifice of Love. This is the one true guarantee of unity amongst men. Then, and only then, will they recognize neighbor as "brother." The Gospel, in story form, illustrates the attitude of different individuals towards the "great supper" of this Divine Bread. All are invited; some stay away, offering the "excuse" of business or pleasure, like the man with his "oxen" (seen in the distance through the window). The picture represents all the suffering masses and classes, ready to commune with one another because they have communed at the "supper" altar rail. Frequently must we commune (Postcommunion).